If you are looking for a Fall pumpkin recipe that is unique this one may just be what you are looking for. 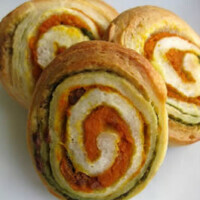 You are likely to get your feel of pumpkin pie, however pumpkin pinwheels are something you rarely see. Combining it with the pesto gives it almost a pizza flavor, and who doesn’t like pizza right. The best thing about this recipe is that it is super simple and really quick to make. This means it is perfect for that last minute dinner party you just got invited to. They are likely to go quick at any social gathering, so be sure to make a few extra for your family at home. Enjoy! Spread pumpkin filling on half of the pillsbury pie crust and spread the pesto on the other half. Make sure both the bacon and sage is crumbled to liking and then layer over pumpkin filling. On the side with pesto add mozzarella cheese as well as a dash of parmesan. Gently roll the Pillsbury crust as tightly as possible in direction that will show both sides when cut. Place the crust in plastic wrap and put in the freezer. Cut the crust and filling into slices and place on a baking sheet. Pre-heat the oven to 400 degrees and bake approximately 20 minutes or until desired.